Wednesday’s announcement that Supreme Court Justice Anthony Kennedy is retiring left prochoice advocates worried that President Trump may nominate a replacement who’ll tip the balance of the panel in favor of tighter abortion restrictions or even the reversal of Roe v. Wade. Van Pelt elaborated in a written statement. Daily updates and analysis on national politics from James Pindell. The retirement of Supreme Court Justice Anthony Kennedy, who has been a key swing vote on several issues, gives President Trump the chance to cement conservative control of the high court. Her words were echoed by Stephanie Schriock, president of Emily’s List, a group that backs prochoice Democratic female candidates. “The ramifications of this announcement are enormous and terrifying,” Schriock said in a statement. “Republicans will use this opportunity to nominate and confirm yet another anti-choice justice to the Supreme Court — a single individual with the power to repeal Roe v. Wade; endangering the lives of tens of millions of American women in the process, jeopardizing our health care, and undermining our rights. Abortion is likely to be one of the flashpoints in the nomination fight. Kennedy has mainly supported abortion rights in his time on the court, and Trump has made clear he would try to choose justices who want to overturn the landmark abortion rights case of Roe v. Wade. In 2016, Senate majority leader Mitch McConnell blocked a vote on then-President Barack Obama’s Supreme Court nominee, Merrick Garland, in the hope that Republicans would take back the White House in the November election and install their own nominee. On Wednesday, Massachusetts Senator Elizabeth Warren made an apparent reference to the 2016 battle on Twitter. Carol Rose, executive director of the American Civil Liberties Union of Massachusetts, also voiced concern over Wednesday’s news. 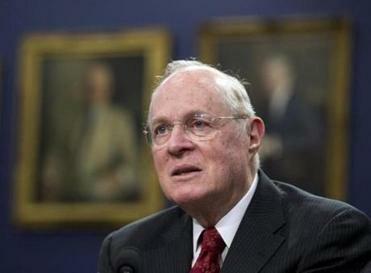 “Justice Kennedy cast critical votes to protect freedom of speech, to prevent the overturning of abortion rights, to limit state anti-immigration laws, to stop the execution of children, to preserve affirmative action, and to recognize the dignity and rights of lesbians, gay, and bisexual people,” Rose said in a statement. Material from the Associated Press and Washington Post was used in this report. Travis Andersen can be reached at travis.andersen@globe.com. Follow him on Twitter @TAGlobe.